Bingo, so people hunting for SMT right now have the process backwards.. 'cart before the horse' as they say. Possibly the real issue is that some are still searching for the 'magic indicator', which clouds their ability to comprehend what has been stated many times by several people. I see the potential usefulness in watching the USDX when you're trading FX. So in order for me to understand the SMT divergence a little better, I created an indi for personal study. I'm a programmer so it's just how I can easily "experience" it. Bottom indicator window is the OHLC chart for the $DXY (cash) and its divergence "ratio" is the purple/blue line overlayed. It goes down when there's a divergence, and is in the middle or in the upper region when it's correlated perfectly. So obvious price isn't going to be 100% correlated, but it's relatively close most of the time. Lets zoom in to 15m. So at 10-11, we're diverged from price. DXY wasn't doing much, made slightly higher highs but we didn't get any lower lows. Noise IMO. So I guess it can give off some signals, but I won't be relying on it 100%. It did do this nicely at the 1.52 level after taking out the highs of the Asian range and previous day so I guess there's that confluence. ToS scaling is odd so it looks a bit weird. But just quickly manually backtesting this, it does have its share of accuracy when it's conflated w/ other tools. I'll be interested to see how you go. 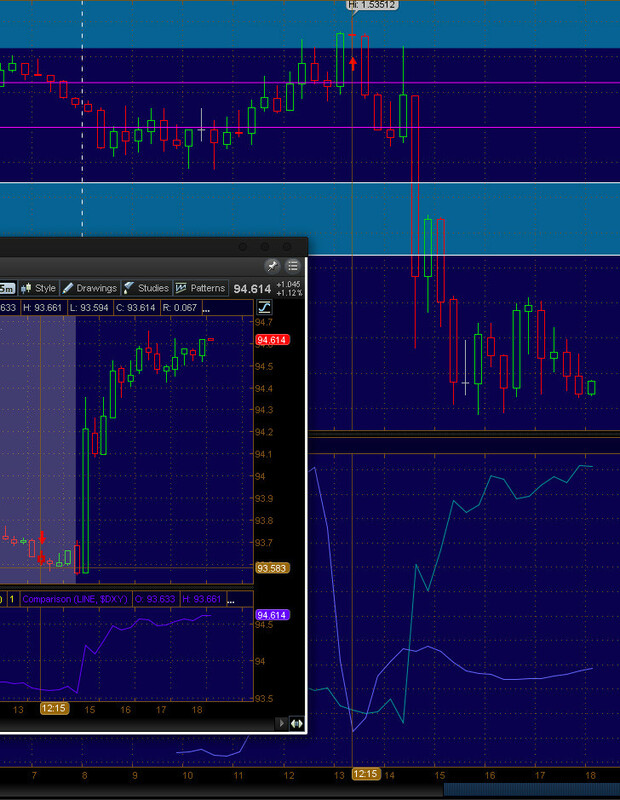 I've only ever used SMT on M15 as a short term confirming tool in the AS. No, it's just as precise as the OB, the key levels of course being the Open and Close. I love it, the concept is basically "damage control" by the players big enough to move the market (lookin at you CBs). Their positions go Negative, but luckily they ARE the market so they take it back down to BE and collapse positions. It works best when one side of the market clearly got caught with their pants down and will need to scramble to get out. That's my take on it, worth the study. precise, yes indeed. Some Traders use similar setups to trade post News big moves. Something to investigate further. Got my RR 1:1 by standing in front of a Steamroller pre NFP, I'll have to stop doing that. Just think of it like this. NFP is creating order blocks for next week. Whatever NFP does, you can be sure to capture most of it next week on a NFP block. 1H block on EJ with 23R potential. this is getting insane... not that it is easy to do real time... but it's there! Your stops are 5 pips? Dang. I have been starting to observe SMT and see if I find it useful. Last night it helped me confirm trade direction and entry. Tonight I noticed this Divergence/Convergence "Coffin". I think it indicates that SM plans to take the Cable up out of the London Open. any idea where this smt indicator is? or has another one. The one on page 1 doesnt work.